I’ll admit the tragic aftermath of Typhoon Haiyan in the Philippines has got to me – badly – and that in part this is because I am due to go there in a matter of weeks on holiday, and I am concerned not only about what we might find there in terms of broken communities, but also whether the infrastructural damage will be so great that we may not be able to go there at all. Selfish reasons aside, the devastation wreaked by natural disasters such as this is on such a massive scale it’s almost beyond comprehension. The only thing we westerners in our comfortable homes and offices can do to help is make a donation to one of the aid agencies that are working in the affected areas. 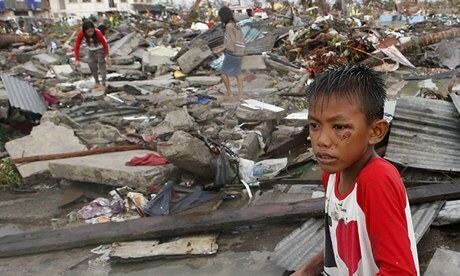 In the case of the Philippines these include World Vision, Oxfam, the Red Cross, Unicef and the United Nations World Food Programme, all of whom have teams on the ground who are working tirelessly to deliver much needed food and supplies to those who have lost everything. Yesterday, after making a donation to World Vision I suggested on social media that others might like to do the same. I was disappointed to see five people immediately un-follow me on Twitter, and unsure in what way I had caused offence by pointing out they could do something to help their fellow humans in dire need. Maybe they don’t believe in charity because they doubt its efficacy, or maybe they already give to different charitable causes and weren’t interested in this particular one. Whatever their reasons, it got me thinking what a luxury it is for those of us in the first world to pick and chooses which causes (if any) we support, and how easily we can choose to change the channel and ‘switch off’ from things that are happening on the other side of the world, right now, to people just like us, who just happen to have been born in a different place, into a different level of privilege and wealth to ourselves. To my mind (and I apologise in advance for sounding sanctimonious as I stand here on my soap box), anyone who is able to support themselves with something to spare for entertainment purposes (drinks after work, theatre tickets, the occasional holiday) can afford to donate a few pounds to help people whose lives are in danger, whose livelihoods and families have been ripped apart in front of their very eyes. We may complain about having no money, but it would do us well to consider what having ‘no money’ really means, and to spend some time thinking about how lucky we are as we sit in our ivory towers, turning the other cheek as we pour ourselves another glass of wine. This entry was posted in Real life and tagged aid, aid agencies, dead, devastation, donate, help, oxfam, Philippines, red cross, selfish, typhoon haiyan, unicef, world food programme, world vision by Belle365. Bookmark the permalink.